Eliot Cutler in November 2010. Ning Lu, a University of Maine graduate student and a member of the Chinese Language and Culture Center of Maine, records a presentation given by Don Reutershan of the Maine Department of Education on national and state perspectives on Chinese language education during the 2011 Maine Chinese Conference on Friday, October 28, 2011. BANGOR, Maine — While Eliot Cutler says that Maine has always had a sound relationship with China, he believes that it can be even stronger. The former candidate for governor delivered a 45-minute speech kicking off the annual Maine Chinese Conference at Husson University on Friday morning. The conference, which has a full plate of activities for students and businesspeople alike, will run through Saturday afternoon. The Bangor Chinese School is hosting the conference. On the contrary, Cutler said that many Maine residents travel to Asia as tourists and come back with stories, and he’s hoping those roles can be reversed. 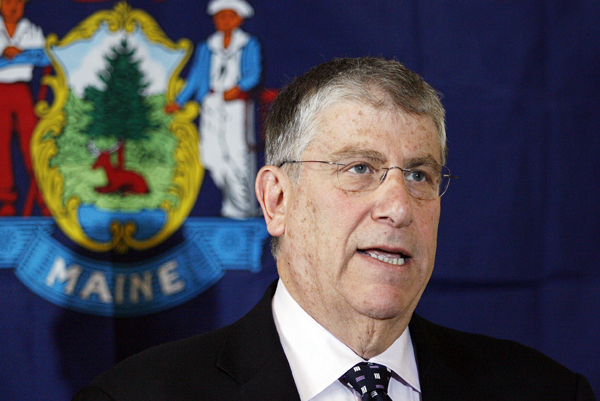 “There are a lot of valuable assets that we have in Maine that the Chinese need,” said Cutler. He said among the assets Maine can provide to the Chinese are schools and colleges in safe environments, recreational opportunities in the North Woods and along the coast, sources of protein such as lobster, beef, lamb and pork and high-end food products such as blueberries and maple syrup. Cutler also noted that if more Chinese tourists and businesspeople come to Maine to seek jobs or vacation, Maine’s economy would see a significant boost. “There is so much more we can do with a focused effort,” he said. Friday’s sessions also included messages from Bangor City Councilor Gerry Palmer and Jeffrey Hecker, dean of the College of Liberal Arts and Sciences at the University of Maine. Educators from several Maine high schools also were present, including Lee Academy Headmaster Bruce Lindburg, John Bapst Head of School Mel Mackay and Orono High School Principal Jim Chasse. Since its inception in 1845, Lee Academy has hosted boarding students from seven different countries in Asia, while 17 Maine high schools from Saco to Limestone feature Chinese programs. Saturday will features a full array of activities from 9 a.m. to 3 p.m. Speakers will include Zhongxuan Jie, a council member of the Nangang District in Harbin, China; Tessa Roscoe of Guangxi University in Nanning, China; Orpheus Allison of Sun Yat-Sen University; Ray Pelletier, a professor of modern languages at UMaine; and Zuzhong Tian, the academic officer at the Bangor Chinese School. All activities will take place at the Dyke Family Business Center.